The Ivy, Dawson Street, Dublin. STAFF AT THE Ivy on Dublin’s Dawson Street have been told they will no longer be allowed process payments from customers after management alleged that some waiters were asking patrons to pay tips in cash, rather than on a credit card. Management at the restaurant posted a staff notice this week to express disappointment that bad manners had been shown to guests by being “consistently asked for cash”. Management also claimed that the cash tips were not being shared with other staff members. The noticed shared with RTÉ’s Liveline today said that a new system would mean no team member is ever to handle cash or card from a guest. Until trust is rebuilt, management will process all payments, the notice said. “This is very disappointing result for us, as we should be a leading light in our company as we have such a wonderful team but instead, we are the headache they have to deal with,” the notice reads. “This is unacceptable to us as managers, our bosses and most importantly our owner. The notice added that no bonuses will be paid while the situation is dealt with. 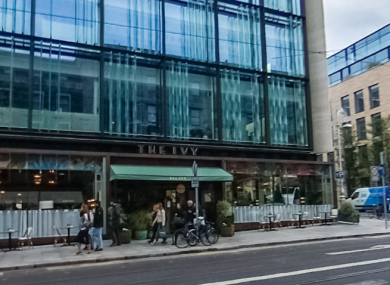 A row broke out over tips at Dublin’s exclusive Ivy Restaurant last week. In response, management put the notice pictured up. In a statement to Liveline today, The Ivy explained that when a tip is paid by credit card, it goes towards a shared gratuity per hour that all restaurant staff – including front of house, bar staff and kitchen porters – receive. The staff that do not follow management’s notice will receive “immediate and swift disciplinary action”, according to the notice. Separately, Sinn Féin spokesperson on workers’ rights Senator Paul Gavan has called for hospitality workers’ to be given a legal right to their tips. Gavan made the call at the at the publication of Sinn Féin’s submission to the Low Pay Commission which is currently investigating the regulation of tipping in Ireland. Gavan said that his party’s submission to the commission has called for workers to have a statutory right to their tips through legislation rather a code of conduct. “Such a code will not work in Ireland’s hospitality sector,” Gavan said in a statement. “This is an industry in which the most basic of workers’ rights are breached on a daily basis, as highlighted by consecutive Workplace Relations Court annual reports. Email “Staff at The Ivy no longer allowed take payments 'to stop the deplorable greed' of asking for cash tips ”. Feedback on “Staff at The Ivy no longer allowed take payments 'to stop the deplorable greed' of asking for cash tips ”.